Looking for a reliable perennial to add color, flair and a touch of fragrance to the landscape? Consider Paprika Fono's Reblooming German Iris. This bold and earthy offering makes quite a scene in sun-filled borders, seasonal cutting gardens and large naturalized focal point areas. 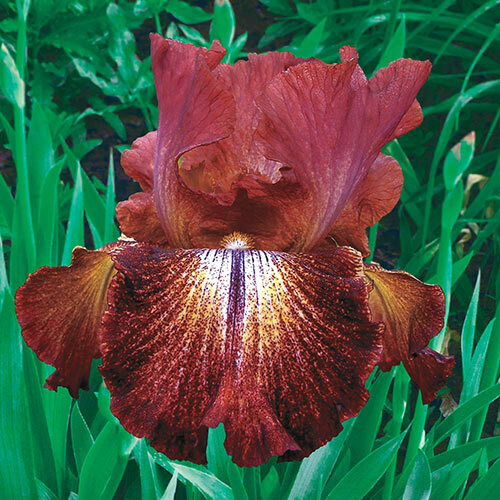 Each spice-inspired bloom features reddish-brown, ruffled petals accented with creamy yellow centers and vivid orange beards. The warm hues look amazing when planted in groups, or alongside solid yellow or white varieties. A mid-spring bloomer, it dependably reappears from late summer to early fall. Deer resistant and easy to grow, Paprika Fono's tolerates many soil types. 5" flowers are fan-shaped, with three drooping petals called falls and three upright petals called standards. Set rhizome so bottom half is below ground level. Once or twice per year. In spring and summer.